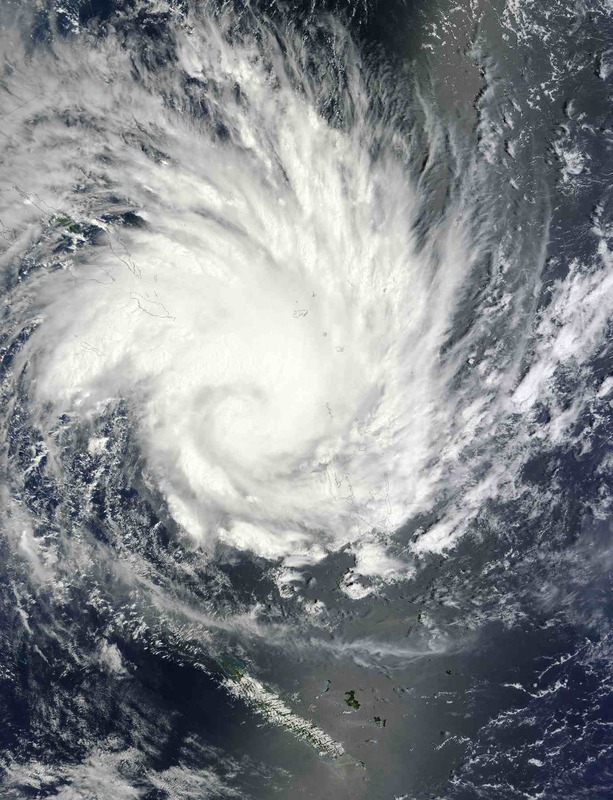 The above NASA Goddard satellite image (view larger image here) is of cyclone Yasi. Tropical Storm Anthony hit landfall in Queensland just this past weekend, after devastating floods also hit the state recently, including in the major city of Brisbane. Now, North Queensland is looking at facing a much larger, more powerful cyclone. This image was taken as the cyclone made its way west through the Coral Sea toward Queensland. NASA noted at 9:20 a.m. Australia/Brisbane local time Monday, “Although the image did not reveal a visible eye, the storm appears to be well-formed and also appears to be strengthening”. By Tuesday morning Australia time it was being reported that the cyclone had intensified into a category three system and is expected to cross the coast as a severe category four, with winds gusting up to 250km/h, very late on Wednesday night. It was also being reported on local ABC News that Yasi is “one of the largest tropical cyclones to approach the north Queensland coast for decades”, and that when it strikes the coast sometime on Thursday morning it will bring destructive winds and a storm surge of up to six meters. Low-lying waterfront areas from Innisfail to Mackay are expected to bear the brunt. Queensland Premiere Anna Bligh has said Cyclone Yasi will be a powerful storm and anyone in its path should take official warnings seriously, saying “If you are in a low-lying waterfront area you should be thinking of relocating your family to a friend in a higher place today.” All ports from Cairns in the north to Mackay will be closed from late today. Evacuations are already under way is some areas. Island resorts in the Whitsundays are being evacuated, and so are low-lying communities in the likely path of the cyclone. Forecasters have said Cyclone Yasi will be similar in strength to Cyclone Larry, which devastated Innisfail and surrounds in 2006. However, Yasi’s physical size is currently much larger, so will impact a larger area of the coast. 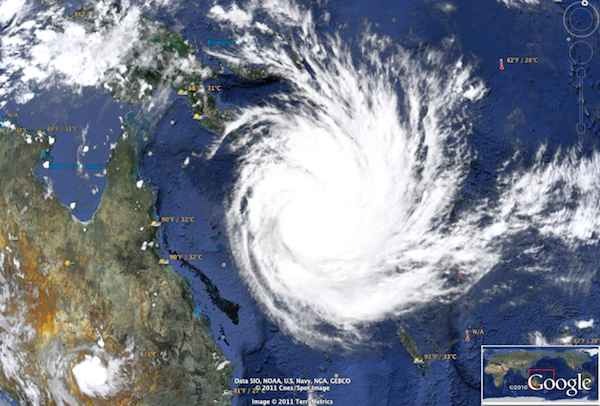 Additionally, the Bureau of Meteorology has warned that it is expected to stay a cyclone well after it hits landfall and could reach as far inland as Mt Isa. Clearly, this is not a weather event to be taken lightly. Here is a link for Current Weather Warnings for Queensland, including Tropical Cyclone Advice for Severe Tropical Cyclone Yasi, and a Forecast Track Map. UPDATE: Here’s an updated image from Google Earth of Cyclone Yasi approaching the Australian coastline. Previous post: Too Many Working Hours At The Expense Of Overall Happiness?